The angular 6-6 swingman scored 21 points in the victory over Milwaukee Friday and is leading the Bulls this preseason in scoring and steals. It hasn't been a holiday very often. 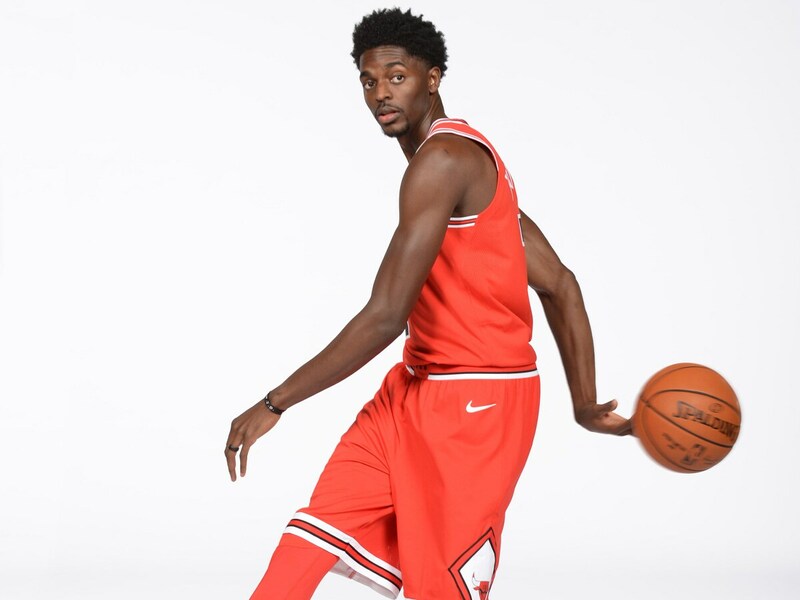 But don't blame Justin Holiday if he believes this uncertain season with the Bulls is a celebration. "To tell you the truth, my whole career prepared me," Holiday was saying the other day as the Bulls experienced similar highs and lows to open the preseason. "There's not much anyone here can probably go through that I haven't gone through. I love being here. There's a great atmosphere, great culture we're trying to build and the young guys again, everybody's playing hard, everybody's competing. It's very competitive out there and everybody wants to play and do well. So it's a great time." The Bulls last July after the blockbuster Jimmy Butler trade to begin a rebuilding made what seemed like a minor—and unnecessary—transaction in reacquiring free agent Holiday. He was a reserve for a poor Knicks team after being included in the Derrick Rose trade. But coach Fred Hoiberg still had on court success in mind and was anxious to add Holiday. "When we made the trade for Justin [at the 2016 trade deadline for Kirk Hinrich], as a staff we fell in love with him right away," said Hoiberg. "He's a talker, communicator; he's a guy that goes out and battles on the defensive end. He's got good length, he's got good pop, he's athletic and he can shoot. We talked about that, and I know he really enjoyed his time here as well. So when he became free, we talked a lot about trying to get him back and we're glad to have him." 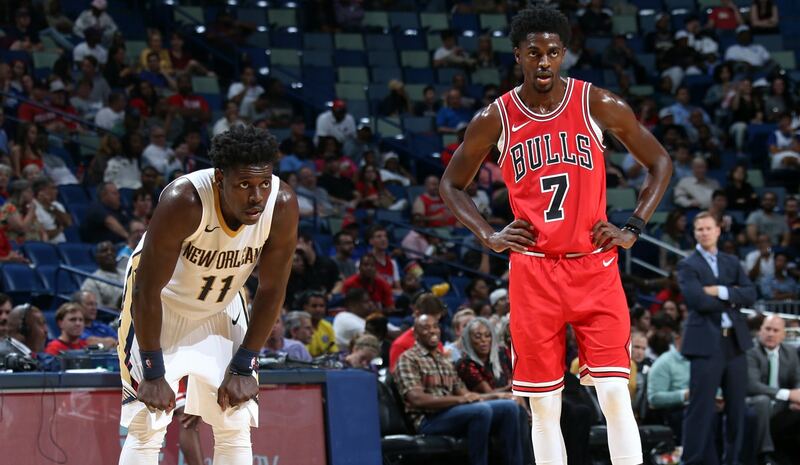 No one has regretted it for a second as Holiday has been the team's best player in the 2-1 preseason start with a 6:00 p.m. Sunday game in the United Center against the New Orleans Pelicans. The angular 6-6 swingman with Friday's 21 points in the victory over Milwaukee is leading the Bulls this preseason in scoring and steals. He's third in rebounding and assists and second in three-point shooting, making a healthy eight of 15 in the three games. With the Bulls coming off that ugly 47-point loss in Dallas Wednesday, Hoiberg chose to open Friday's game with consecutive plays to Holiday. He responded with scores and the Bulls went on to lead most of the game. "Justin's not the kind of guy that you throw the ball to, have an isolation situation with him," said Hoiberg. "He's more of a movement guy and he's more of a cutter; get him on some back cuts and he can really get out on the break and run. But there were things we ran for him." It's an inspiring and encouraging story, certainly for Holiday at 28 with the first non-minimum guaranteed contract of his career, a modest $9 million for two years. But it may be the best money the Bulls have spent. Holiday is starting at shooting guard now and probably will move to starting small forward when Zach LaVine is ready to play, perhaps in two months. Not only is Holiday producing on the basketball court, he emerging as the outspoken leader on this young Bulls team, a man with an appealing basketball savvy and uplifting attitude and experience that is an appropriate model for a young team facing a season of challenges. Holiday has faced them in his basketball life. But he never yielded to the doubters, critics or his own disappointment. He simply committed himself to improve and do better, not to give up but rise up. "That's what my whole career has been, growing and getting to the next level to try to prove and hopefully I'll take another step forward this year"
"I had struggles in college no one knows about from not starting for two years, not playing much to playing more," Holiday said. "It's the work I had to put in, getting over, which is kind of hard to say, not so much denied, but not having what you should have at that time and being able to learn to play through whatever is put in front of you, whatever the situation is. Whatever you are given you have to deal with it and if you really want something you are going to work for it and not give up. I know about going through adversity and being denied. "I won't say I'm proud of it," Holiday added. "But it's the plan God has for me and even where I am now it will help other people than just me being here in the NBA. I think it will help others when I do speak and tell them you can get where you want. You just have to be able to know how to get through adversity and being able to continue to push and push through it until you get where you want. I understood there was a chance I might not make it. But you tell me I'm not and I feel it's going to happen for me." Holiday is the older brother of the more successful, Jrue, the Pelicans' point guard. But Justin took a very different path. While Jrue was a first round draft pick after one year at UCLA and being the nation's second ranked player his school senior, Justin came off the bench his first two years at the U. of Washington. He then became a defensive specialist playing with Isaiah Thomas—no one else is really getting the ball, anyway—averaged fewer than 10 points in his four-year college career and went undrafted in 2011. And so began his pro basketball odyssey. First it was a season in Belgium, summer league in 2012 and waived by the Cavs and Trailblazers and then the D-league. He closed out 2012-13 with a few games with the dumping 76ers. Remember, they were only signing players then they believed would assure them losses. "Not getting drafted was hard when I was young and I thought I would," Holiday admits. "Playing overseas that first year was a whole new world; no internet or phone when got there. Thinking. ‘How am I going to be able to do this?' Getting cut is tough at times. The type of person I am, if get down or go through a hard time it motivates me. I never feel I can't do something; if I'm told I can't do something it pushes me." Holiday had a good summer league in 2013, so, of course, the 76ers cut him. He played 2013-14 in Hungary. He caught on with the Warriors in 2014-15, and though playing also in the D-league got himself a championship ring for about 600 minutes of playing time in Oakland. 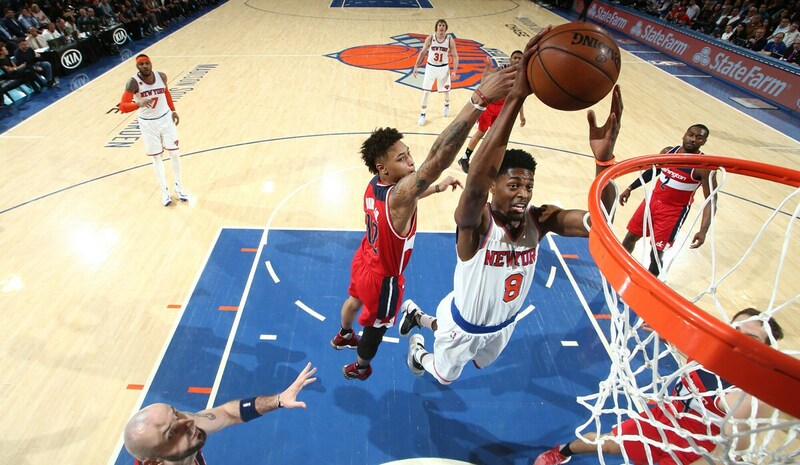 He signed on with the Atlanta Hawks for a small deal in 2015-16, was traded to the Bulls for Hinrich, and then went to the Knicks. Where though the team lost, was apparently in dysfunction and he didn't start, Holiday said it was his big break. "Last season was big for me," Holiday acknowledged. "I played all 82 games (four starts). For me, that was a big deal because that got me going and how I played at times when things got tough on the court, when I didn't shoot well, to be on the court and know I've been through a season there's not much I can't do. I've been cut I don't know how many times, but I'm here. "That's what my whole career has been, growing and getting to the next level to try to prove and hopefully I'll take another step forward this year," said Holiday. "It's more of a leadership role here, to make sure I lead in the way that helps. Most of the time I'm used to being on a team being one of the middle guys. So I make sure I take care of my business. You need to be able to teach and help; I know I can play this game." That, of course, is the most important part. But running a close second, especially for this Bulls team, is having that guy around who has seen the ugly underside of the game, traveled the road of doubt and downfall and found safe passage despite the obstacles. When the nights are long and lonely, everyone needs support. "We're here to win regardless of what people might think or say," assured Holiday. "We're not on this NBA team just to be here, just to hang out. We're here to win games. That's the process we're building however long that takes or whichever way it takes for us to get there. That's what our plan is and that's what we're going to do. In my NBA career, I've been through a lot. I can help these young guys develop. There's going to be adversity. That's one thing I've been through if you know anything about my story. So I'll be able to lead in that way, help the young guys be poised, continue to fight. That's what they're going to have to do, be able to fight through tough times. I'll for sure be able to help them."